Carrer Petritxol, is one of the most representative streets in Barri Gotic, Barcelona. This famous 'carrer' stretches from Portaferrisa street (mentioned in the sign as the only exit for vehicles at the other end of the alley) and Plaça del Pi. It goes almost parallel to Las Ramblas (two blocks away) and it is definitely one of my favorites. I showed a picture of Petritxol street here once and also referred to famous xocolata amb xurros (churros consist of dough which is later fried and powdered with sugar, preferably to be dipped in hot chocolate) served at La Pallaresa or at Dulcinea, Petritxol 2. The renown Sala Pares founded in 1840 and the center of Barcelona's artistic life by the end of XIX is the main art gallery at Petritxol 5. It is said that it was due to the presence of such galleries that the churro houses were established in the first place. The whole bohemian atmosphere is sustained by the presence of painters selling their work in the square nearby next to Santa Maria del Pi church. Petritxol is more or less 2 meters wide on the Plaça del Pi side. The name probably comes from portitxol (Cat.) (small door) and its origin is connected perhaps to a negotiated access from Portaferrisa to the only Christian church that was left in Saracen times in the area. Christians lived outside the wall in El Raval and had to walk a long way to a very early Mass that wouldn't interfere with Muslim morning prayers. A short and thus faster way would facilitate their attendance on time. It is said that an old priest found a hidden treasure left behind by the Christians and convinced the Emir into building the passageway. Believe it or not there was some sort of peaceful coexistence between Muslims, Christians and Jews at the times although all of this was about to change. The story behind the street is part of a legend so don't take my word on it. 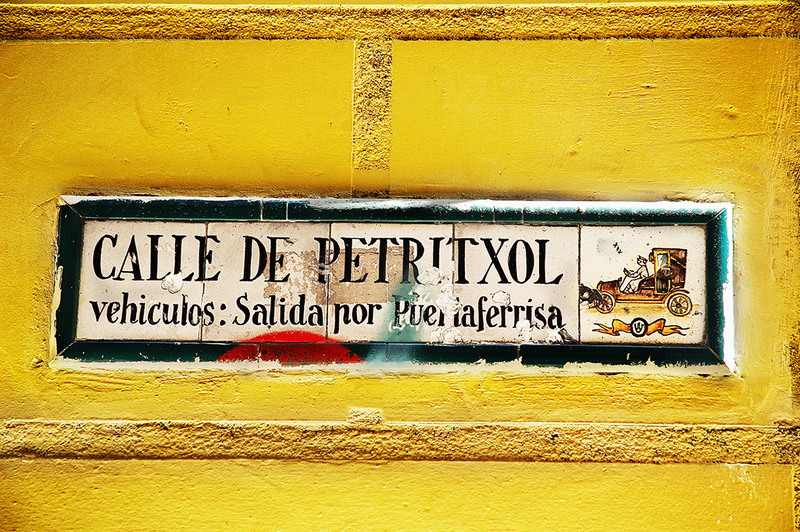 Here is Calle de Petritxol on a map. Fascinating history...I think I'd like to visit this street...and that sign is incredible! What great colors! Great photo - interesting story! I like taking pictures of signs. beautiful! how long has the building been yellow for? Hi everyone. Thanks. Amy, to tell you the truth the wall is not that yellow but I thought this would enhance the sign. Now that you mention it: I try to edit the image so it looks better but without completely distort the essence of it all although I am aware that color does attract the eye better than dull stark reality. This time I took the liberty of over saturating the ocher wall.